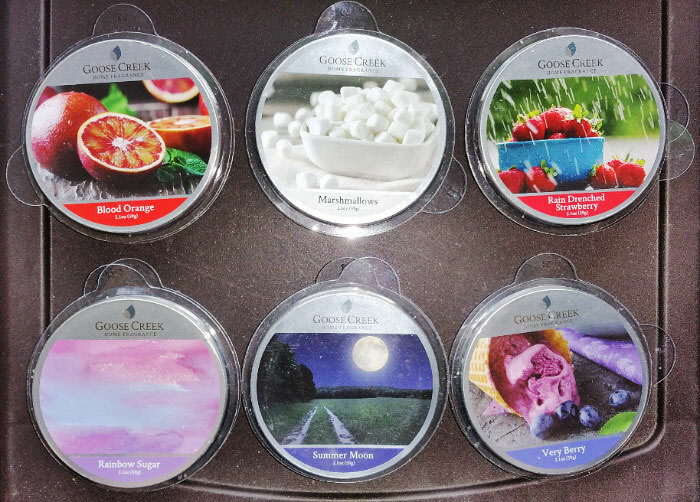 This is a review of Goose Creek Candle Wax Melts from May 2018. Goose Creek Candle hit it out of the park with these new Spring 2018 scents! They all smell fantastic! And as a bonus, the lids fit tightly on the clamshell, which is good because with many of the older ones I have, the lids fall off easily. Goose Creek Candle wax melts and candles can be found on their website at goosecreekcandle.com, and at some stores like Gabe's and Tuesday Morning. This smells like lemon, grapefruit and orange with a tangy, slightly savory note. It's a totally different orange scent than I've ever smelled. It's not a bright, citrusy, sweet orange juice scent at all. It only has a hint of sweetness, but it's also not a pungent, citrusy orange scent like ScentSationals Molten Orange (although I love that scent too). Fantastic scent! A very nice milky vanillary marshmallow scent. It's not a Bath and Body Work Vanilla Bean Noel type scent at all. It's more milky and marshmallowy, with maybe a hint of smokiness (perhaps the "toasted" part of the vanilla creme) and even a barely detectable smidgen of a laundry note. I really like it. In 2016 Goose Creek had a scent called Campfire Marshmallow, but I don't remember if this is the same scent or not, although I did describe it the same way. That scent did not throw well (and it used the older soft messy wax), but this one does. Fantastic rich succulent super strawberryish strawberry scent that smells like strawberry sorbet or gelato. It's not a creamy scent like iced cream, and although it's quite sweet, it's not sugary sweet like strawberry jam. It's actually a rather authentic strawberry scent, like the inside of a jumbo sun-ripened fresh garden strawberry! I adore this scent! This is Pink Sugar! It's a super sweet marshmallowy cotton candyish scent with a raspberry note and a tiny bit of a perfumey note. One of my favorite scents! I think this one might be sweeter, slightly more fruity, and much less perfumey than some other Pink Sugar scents I've smelled. It's similar to Better Homes & Gardens Pink Sugar Berry, but again, a bit sweeter and more raspberryish. This is a nice men's herbal body wash scent, like a Cool Water men's cologne type scent. It's not overly sweet, and I think I detect a smidgen of lavender and pine. I really like it. I love this scent! I smell super sweet blueberries with a sugary slightly marshmallowy cotton candy note, a little like the Rainbow Sugar scent ("Pink Sugar") but with blueberries. It's not an authentic fruit scent, but it smells fantastic. Looking at the scent notes, I don't smell peach or apple, but maybe a little raspberry.